Raising My Rainbow is Lori Duron’s frank, heartfelt, and brutally funny account of her and her family's adventures of distress and happiness raising a gender-creative son. 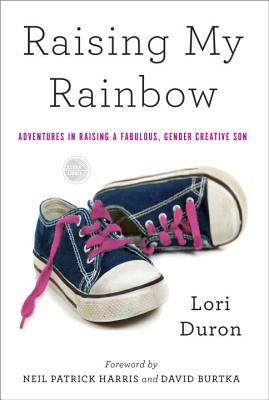 Lori Duron is the author of Raising My Rainbow: Adventures in Raising a Fabulous, Gender Creative Son. The first parenting memoir to chronicle the journey of raising a gender nonconforming child, the book is based on her popular blog of the same name. RaisingMyRainbow.com has more than two million readers in 173 countries, including gender studies students and faculty at more than 50 college and universities in the U.S., Canada and the U.K. Duron and her blog have twice been named one of BlogHer’s Voices of the Year; one of Ignite Social Media’s “100 Women Bloggers You Should be Reading;” one of Circle of Moms “Top 25 SoCal Moms;” and one of Parents Magazine’s blogs that are “Most Likely To Change The World.” Publishers Weekly recently named Raising My Rainbow one of the Best Books of 2013. Duron and her blog have earned the attention of a variety of media outlets including: The TODAY Show, CNN, Time, Anderson Cooper, People, BBC, MSNBC, The New York Times, The Huffington Post, Psychology Today, Fox News, Out, The Advocate, Newsweek, and The Atlantic. Duron lives with her husband and two children in a happy, messy home in Orange County, California. "[S]mart and witty...first-of-its kind...a frank, funny, feminist book." "First drawn to Lori's work as an educator and LGBT activist, it was my role as a father that provided the most poignant critical lens for Raising My Rainbow. While nobody has a blueprint for parenting, Lori's compassionate, insightful, and yes, humorous take of raising a "gender creative" child should be required reading for anyone bringing up or working with children."